How Old Is The New England Virginica Oyster? When you or I eat a native New England oyster, we are sharing an experience with human beings from other times. 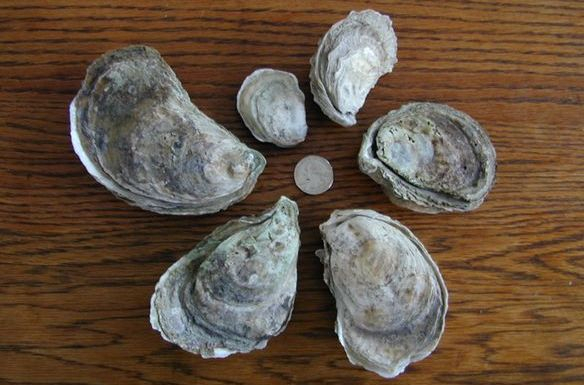 Numerous virginica oyster shells have been unearthed in archeological digs from native American Indian tribes. They precede European settlers by hundreds of years. The fact that we can consume them raw, further adds to the realization that the taste sensation is an ancient one. The question is, just how old is the virginica oyster? A recent Sea Studios Foundation production traced the origin of life on Earth back to the simplest life forms. The series, entitled "The Shape of Life" included marvelous animated episodes that began by examining sponges. According to the study "almost every animal that ever lived fits into one of only eight body plans that emerged about 550 million years ago and endure to this day." Molluscs were one of these primary body plan groups, the sixth evolutionary group. That story puts oysters on Earth but doesn't put virginica oysters in New England. A book entitled Stone by Stone authored by Robert M. Thorson adds a further piece to the puzzle. The book attempts to trace the history of New England rock walls. Thorson is a professor of geology and geophysics at the University of Connecticut. About 300 million years ago, says Thorson, a continent to continent collision took place on Earth that resulted in a mountain range from Florida to northern Norway. The range is now called the Acadian Mountains. Most importantly, the collision separated the land mass that is now New England from the island of old England. Extreme pressure and heat transformed sand into rock in a layer ten to twenty miles deep on the surface of the Earth. The creation of the rock also has documented the existance of the early Jurassic age 225 to 170 million years ago. It is only in the last 2 million years however that the glaciers covered the Earth's surface and by moving carved out the valleys along the coast of New England. Islands were formed during that time and the famous "boot" that is Cape Cod was defined. As the ice sheet melted, the sea rose and created the coast line of New England. Thorson, puts this time at about 15,000 years ago. As a result of this series of events, the native virginica oyster could not have had a home until that time. It is fascinating to note that oysters are also native to England, but the shape of the native English and Irish oysters are flatter and more closely resemble the Belon oyster found in France. The cold water version of the virginica oyster is defined as a virginica oyster that must endure a winter so cold as to require that it defend itself under a layer of ice by "hybernating". For all intents and purposes, all of the oysters raised above the "boot" of Cape Cod, Massachusetts are cold water oysters. Because they essentially shut down their bodies for several months in winter, these oysters awake and emerge in the Spring with thin. leaner, bodies. It often takes all Summer for the cold water oyster to regain enough fat and return to its characteristic sweet taste. A valuable byproduct of this slowing down of its metabolism is that the oyster can be successfully boxed and stored by oyster farmers over the cold winter and shipped long distances without ill effects. A disadvantage is that cold water oysters may not be at their best taste in the Spring and Summer months. It is ironic that the cold water oyster is still defined by the ice that forms above it - many years after the glacier initially did its work.